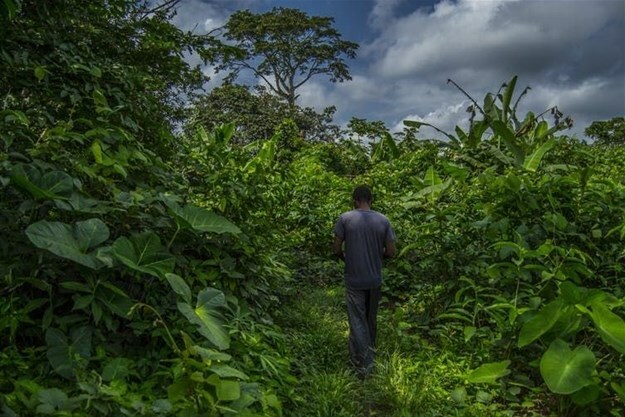 A quarter of a century ago, Cameroon passed a law which gave people living on the edge of forests the right to own and manage forest areas. These communities depended on the forest for livelihood activities, like agriculture, hunting, fishing and non-timber forest products - like fruits or medicinal plants. About 40% of Cameroon’s territory is covered in forest. But they’re being threatened by deforestation. Over about 25 years, 3 million hectares of Cameroon’s 22 million hectare forests have been cleared. That’s about the size of Belgium. This is a huge concern for the country as about 4 million people depend on the forests for their livelihoods. So far about 415 forest communities have signed management agreements, covering about 1 million hectares. The aim is to reduce poverty in these communities – as they would benefit from its resources – and – because it would be in their best interests to manage them sustainably – protect the forests. There have been reports of improved forest conservation and livelihoods in some areas. In the Ngoume community for instance they used money from timber to build bore holes and start a kindergarten. But research shows that for most the forest communities there’s been little or no change in their livelihoods. There have also been reports of illegal logging and deforestation. Forest communities closer to major cities – like Nkimineki and Awae – have been particularly affected. Community level governance has been highlighted as one of they key reasons for these mixed results. Communities elect a management committee to act on their behalf, check and fight illegal forest activities and develop activities that generate revenue for them. We examined 36 of these management committees. We wanted to know whether they followed standard principles for good governance: accountability, equity, participation, representation, their vision and performance. Our results were mixed. Some met the required good governance standards, but the majority didn’t. For instance, 78% of case studies didn’t meet the standards for all the principles. This was mostly because there wasn’t enough money coming in or because committee members lacked management, entrepreneurial skills, managed the forest in their own interest or had disagreements between them which prevented them from being effective. To avoid these challenges, countries considering Cameroon’s example must have the right laws and procedures to develop income-generating activities and committee members must also be properly trained. For community projects to succeed it’s key that community members participate in decisions that affect them. This includes choices on who represents them, which community projects will be financed and on the type of income-generating activities that take place. But community participation in Cameroon’s community forest projects was only seen in 17% of the case studies. In most cases, important decisions were made by the management committee without consulting the community. Women and minority groups – like the hunter-gatherer Baka group – were often sidelined. None of the management committees gave feedback on community forest activities, income from timber exploitation and spending. They also didn’t ensure all social groups – men, women, young people and minorities – had equal access to benefits and resources. Just 25% included them in management, decision making and income-generating activities. To see if the forests were being well managed, we investigated illegal logging, deforestation rates and forest management. And to look at whether livelihoods had improved, we looked at whether communities had better access to social amenities – like health facilities – and work. Just 20% of case studies had a clear vision to replant trees and monitor the forest against illegal logging. And only 45% met the necessary performance standards when it came to improved livelihoods. Although the committees weren’t good at governing, there were some cases that showed promised and provided lessons. A lack of income generating activities pushes community members to ignore community activities, like meetings or forest monitoring, for activities for their personal gain, like agriculture or hunting. There must be incentives – like loans, tax breaks or the eco-labelling of products to improve their value – for community, income-generating activities. This will allow the management committee to use funds for community development projects. In most cases, community members lacked technical knowledge which would help with governance. Things like forest management, conflict resolution, contract negotiations, basic accounting and reporting of forest activities. There should be periodic national workshops, in collaboration with stakeholders from the government, civil society organisations and communities to address this. In a few case studies there were influential members of society – within and from outside of the community – helped to provide financial, technical and administrative support to the community forest. We called these people “positive elites”. They could help by sharing their expertise in administration, management, community development and should be given incentives, like awards for positive outcomes. If these incentives are actively considered in future policies, they could serve as an example and help enhance and stimulate good governance within community forestry in various countries. Serge Mandiefe Piabuo is a Scientist at the World Agroforestry Centre (ICRAF). Divine Foundjem Tita is a Scientist at the World Agroforestry Centre (ICRAF). Peter A Minang is a Scientist at the World Agroforestry Centre (ICRAF).